Have you ever learned the meaning of word and then a few days later you read the word in a magazine, then someone mentions the word at a party, and shortly thereafter you see it repeatedly? I had a similar experience with someone I just recently met and want to share some of the great things I’ve already experienced from this relationship. If you follow this blog, then you know I’ve been a long-time supporter of the Tile Heritage Foundation. Joe and Sheila co-founded the Tile Heritage Foundation in 1987; Joe serves as the Foundation's president. When I first joined many years ago, I had the great pleasure of meeting Sheila Menzies at the Coverings Booth; but, Joe and I seemed to always miss each other. I had the great pleasure to meet with Joe and Shelia this past June to help better understand the THF’s goals and how I and my company, Avente Tile, could further their worthy cause. A few weeks later, my spouse visited The California Heritage Museum in Santa Monica. This small museum has a great mission: to present displays of American decorative and fine arts, and to promote the passion that is collecting. On my spouses’ return, I received a wonderful book about "California Tile" that is edited by none other than, Joseph Taylor. for historical California tile patterns. California Tile: The Golden Era 1910-1940: Hispano-Moresque to Woolenius was first published December 1, 2003 by California Heritage Museum for an exhibit with the same name. Joseph A. Taylor is the editor for this book. How I missed the book or the exhibit at the California Heritage Museum, I'll never know. But, if you love tile and have a passion for the great California tile makers like Batchelder, Malibu, or Pomona, then you'll love this book. It has great photos of tiles, installations, and the manufacturing process. Here's a paragraph from the introduction by Joseph Taylor: "Over the years ceramic tiles integrated themselves it the cultural fabric of California; tiles are everywhere and they're convincingly apparent. The brightly colored wall tiles along with the rich earthen roof tiles and pavers, often found in stark contrast to white stucco facades, have woven their way into the community conscious. 1920s decorates this window in Los Angeles. Lastly, the tireless effort that went into researching and publishing this work should be applauded. With hundreds of tiles from Hispano-Moresque, Kraftile, Helen Greenleaf Lane, Malibu, Markoff, Muresque, Pacific, Pomona, Tropico, West Coast and more, not only is this publication a great source of inspiration, it's also a vehicle for instilling a sense of appreciation of the colorful art form of tile. Subscribe to Tile Talk and receive our free monthly newsletter via email. Since launching our new line of Porcelain Pool Tile earlier this month, we've been getting a lot of questions about what makes porcelain tile better than ceramic tile. More commonly, the question is simply, "What is the difference between porcelain and ceramic tile?" It’s a question I gladly welcome and one that is fairly easy to answer. Glazed porcelain tiles, like the blue tiles used for this fountain, are a good choice for pools and spas. Homeowners often discuss ceramic and porcelain interchangeably, as if they were one and the same. To add confusion, tile shop salespeople often extol the superiority of porcelain and claim there is a chasm that separates the two. Porcelain tile tends to be more expensive and this is one reason salespeople will try to "justify" porcelain to those not versed in tile’s technical details. Porcelain tile is a type of ceramic tile and nothing more. In other words, all porcelain tiles are ceramic tiles; but, not all ceramic tiles are porcelain. Porcelain and ceramic tiles are very similar, especially when compared to cement tiles, quarry tile, glass tiles or stone. Porcelain, by definition, is a ceramic material made by heating materials, including clay in the form of kaolin, in a kiln to temperatures between 2,200 °F and 2,500 °F. Porcelain has high strength and translucence because of the formation of glass and minerals within the fired body at these high temperatures. Porcelain derives its present name from the Old Italian porcellana (cowrie shell) because of its resemblance to the translucent surface of the shell. While all of this might be interesting, it has very little relevance to porcelain tile. A tile can be a porcelain tile IF AND ONLY IF it has a water absorption rate of 0.5% as defined by American Society for Testing and Materials (ASTM) C373. To pass the test, a group of tiles is fired and then weighed. The tiles are boiled for five hours and then they sit in water for another 24 hours. Then, the tile is weighed again. If the tile weighs less than half of one-percent more as a result of water absorbing into its surface, then it is considered porcelain. No cowrie shells here. Porcelain tile is typically extruded and will have less impurities than ceramic. It may be rectified and usually contains more kaolin than ceramic. However, the defining difference is that porcelain must have 0.5% or less water absorption rate. Some ceramic tiles, like these decorative Malibu tiles on the stair risers, are rated for freeze/thaw cycles. Due to confusion and dishonest tile companies, the Porcelain Tile Certification Agency (PTCA) was created to certify tile as being porcelain or not. So, according to the PTCA, a tile has to meet ASTM C373 standards of water absorption to be branded as porcelain. A company does this by sending in five tile samples for testing, paying a fee, submitting a participation agreement, and renewing certification every three years. After certification, a company may use the "Certified Porcelain Tile" branding. Only a score of North American tile companies have received Porcelain Tile Certification. Porcelain Pool Tiles – Plain (solid-color) porcelain tiles that have been freeze/thaw tested. They are great for spas, fountains or any outdoor application. Yucatan Field Tile – Vitreous tiles are another type of ceramic tile that generally absorb very little water. We've used these tiles for projects in Colorado cabins at 7,000 ft. elevations that aren't used in the winter. The tiles are in great shape, year after year! 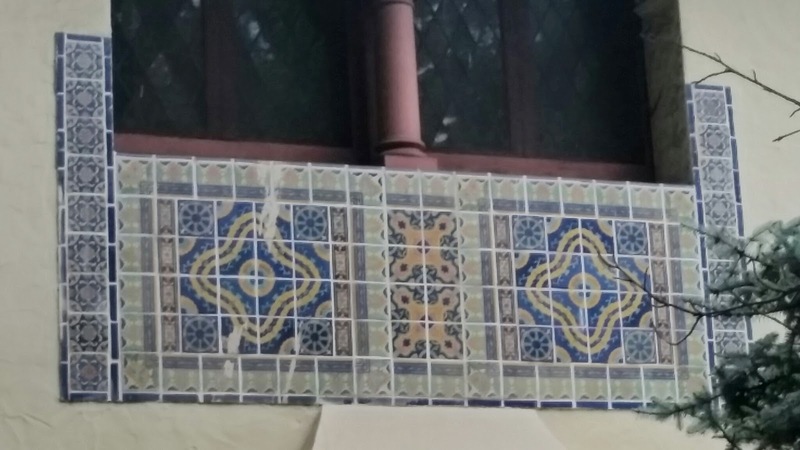 Malibu Decorative Tiles – Decorative ceramic tiles that have been freeze/thaw tested and pay homage to the Spanish Revival period of Los Angeles. Malibu Field Tiles – Plain (solid-color) ceramic tiles that have been freeze/thaw tested and coordinate perfectly with our Malibu decos. While conventional wisdom has been to keep porcelain or ceramic tile away from the outside, you can see there are lots of options for ceramic tiles that are suitable for exterior use. Porcelain does offer some benefits that you won’t find with ceramic. However, for most residential application most of these benefits are "gold cladding inside a steel suit of armor." In other words, while true, you probably won’t benefit from them – especially if using a glazed porcelain tile. Porcelain clay is more dense than ceramic clay. Therefore, porcelain tiles are less porous than ceramic and this makes porcelain tile harder and more impervious to moisture than ceramic tile. The increased density also makes it more durable and better suited for heavy usage than ceramic tile. For instance, unglazed porcelain in a restaurant is the best choice for a hotel lobby or restaurant entry. Unglazed porcelain has through-body composition and color. Chip a glazed ceramic tile and you find a different color underneath the top glaze. Chip the porcelain and the color keeps on going--the chip is nearly invisible. While both porcelain and ceramic are fired, porcelain is fired at higher temperatures for a longer time than ceramic. Additionally, porcelain has higher feldspar content, which adds to its durability. The strength in porcelain tiles means they resist wear and abrasion and the Porcelain Enamel Institute (PEI) ratings for porcelain tile tend to be at the top of the scale (4-5). The PEI ratings for ceramic tile can land just about anywhere on the scale from 1-5. The PEI ratings is commonly referred to as “abrasion resistance” and is probably the most commonly used industry rating for wear. PEI Ratings of 5 are good for heavy residential and commercial traffic, whereas a PEI 1 is recommended for wall applications only. Porcelain or vitreous tile work well for an outdoor counter subjected to freeze/thaw cycles. I've had people request decorative porcelain tiles with a PEI 5 rating. I've asked them, "Where are you using the tile?" The customer replies, "On my kitchen wall. I want the best tile!" Different tiles and tile materials are manufactured for different applications to provide the best results. Take into account the application first and also who will be doing the installation. Ceramic tiles are less dense than porcelain tiles and usually a far easier material for homeowners and DIY installers to cut. Porcelain requires experience to cut because it is very hard and brittle compared to ceramic. Remember, ceramic tile will be less expensive than porcelain tile. While porcelain has many benefits, ceramic may the best choice for the job! Handmade cement tile has to be one of the most beautiful types of tile available for transforming a space into a personal expression of pattern, style and design. However, since it is a handmade product, figuring out what makes a high quality and durable cement tile isn't immediately obvious. For that reason, Avente Tile is proud to announce the launch of its Guide to Buying Handmade Cement Tile to help you make sense of the choices available. The Guide, which is based on the hard-earned knowledge and experience of Avente Tile's founder Bill Buyok, features 14 pages of inspirational cement tile installations and patterns, and most importantly, valuable tips for buying handmade cement tile culled through Bill's vast experiences and travels involving handmade cement tile. A sample page of Avente Tile's Guide to Buying Handmade Cement Tile illustrates the beautiful and vivid patterns available with handmade cement tile. Months of thought, preparation and revisions went into creating this cohesive Guide so that it could be referred to at any time, day or night, 24/7. Whether you choose to print out a copy of the Guide, or keep it on your computer's desktop, we wholeheartedly feel that having a readily available source at your fingertips is a priceless tool for generating creativity, while greatly expanding upon the design needs and options of your tile project. What is Handmade Cement Tile? What Shapes, Sizes & Formats Are Cement Tiles Available In? 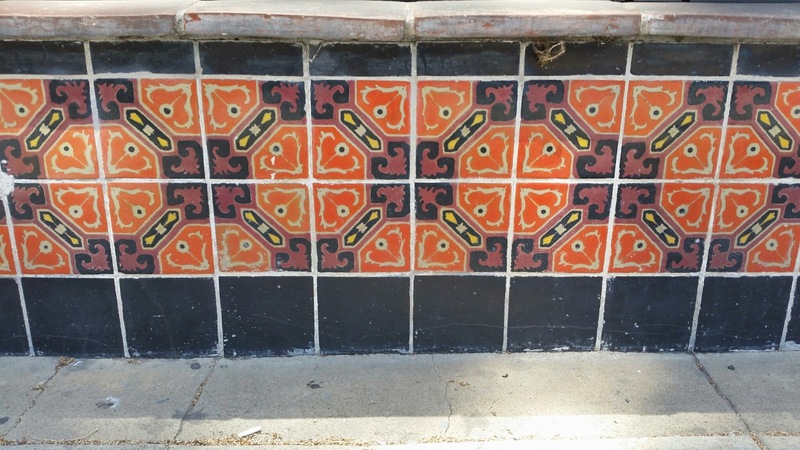 What Cement Tile Design Styles Are Available? 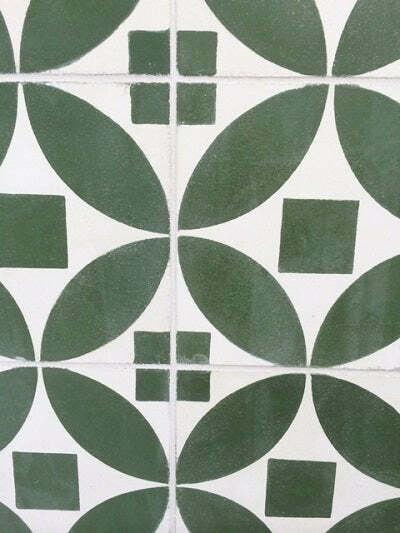 How Do I Coordinate Handmade Cement Tile Sizes, Shapes, Formats and Styles? What Are the Next Steps For Buying Handmade Cement Tiles? Active links within the Guide to Buying Handmade Cement Tile (highlighted in yellow) immediately direct you to comprehensive information about the topic or product you’re interested in. Find the cement tile that's right for you. 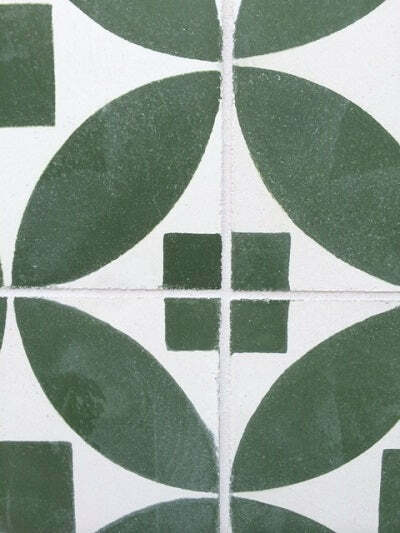 Learn how to distinguish quality cement tile from inferior ones. Understand the types, formats, colors, options and designs available. Set realistic budgets, costs for freight, and what to expect for delivery. Tips for when to use in-stock tiles, custom tiles, and how to create your own designs. The Source for Finding Cement Tile That's Right for You. One of the greatest joys about blogging and my love of tile is sharing fabulous installations using cement tile like this one featured in House and Home. 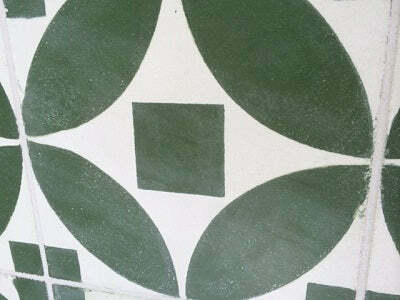 The cement tile installation uses a Geometric Moroccan Circle pattern in soothing green. Cement Tile in a Geometric Moroccan circle pattern. I also enjoy educating people about cement tile and making sure they know the differences between cement tile and it more ubiquitous cousin, ceramic tile. 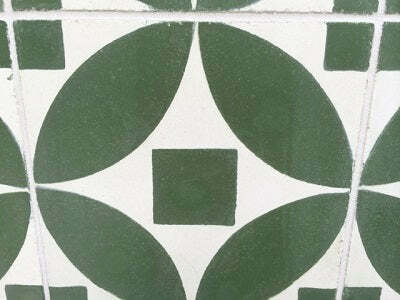 Because it is very porous, cement tile is more prone to grout haze than glazed ceramic tile. Today, I'll explain why grout haze occurs, how you can spot it and how to remove it. Last week I received an email from one of the design firms in Berkley, CA, that we work with. Overall, the design firm's client was thrilled with the tiles and the install. 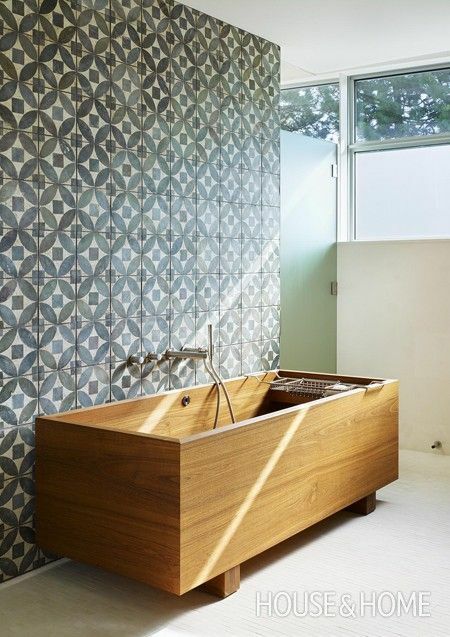 The installation featured our Geometric Moroccan Circle cement tile for a bathroom in San Francisco. The tiles were installed on both the floor and wall. Unfortunately, a "white film on the tile" could be discerned after they were sealed. Grout haze on a cement tile installation. The "white film" you see on the dark green pattern of the tile is grout haze. Grout haze will generally appear as a white or grey streak on the dark colors in the pattern. The streaking color will depend on the color of grout you choose. Streaking caused by residual grout left on cement tile. During the installation, the tile is smeared with grout. The streaking occurs from the float or squeegee that is raked over the tile. Always remove grout with a rubber float and sponge. The installer has to physically remove as much grout as possible with a rubber float and then with a sponge after coating the tile with grout. A very liquid grout must be used for cement tile to avoid grout haze. If the grout becomes too dry during application, it can penetrate the cement tile pores. The haze will become apparent after the water on the tile surface evaporates and leaves behind the minerals from the grout. Remember, the grout is applied between the spaces of tile using a tile float, and then wiped away with the same tile float and a wet sponge. Follow these best practices when grouting. You may use colored or white grout. If you decide to use colored grout, then we recommend that it be a color that is the same, or lighter than, the lightest color used in the pattern. Follow or share these tips with your installer to avoid, minimize and remove grout haze. These guidelines apply only to cement tile installations. Make sure to physically remove as much grout as possible with a rubber float and then with a sponge. Make sure the tile is completely dry, clean and free of grout before applying a penetrating sealer. Start with a light buff and clean. For floor installations, buff the floor with a floor polisher and white pad. Use just a bit of water and change the pads frequently to encourage the clean-up of any grout. If you don't achieve the results you are looking for, then attempt a deep cleaning. A deep cleaning is achieved by buffing the floor with a floor polisher and green pad using a lot of water and pH neutral soap. This must be done prior to applying a penetrating sealer. The goal is to really clean the floor of any dust, grout, pigments or debris prior to sealing. The use of a floor polisher and green pad isn't usually necessary on polished tiles. Polished cement tiles are "buffed" at the factory to achieve a satin sheen that simulates the look the tiles acquire after years of normal use and care. The surface of a polished tile is smooth compared to an unpolished or raw cement tile. The smooth surface of a polished tile makes it easier to install because grout is less likely to penetrate the tiles. In locally severe locations or if the tile has been sealed, use 800 grit wet sandpaper and water to remove excess grout. Cement tile is fairly easy to clean with a floor buffer or rags, water, soap and elbow grease. Occasionally, fine grit wet sandpaper may be required to remove excessive grout haze. Always, protect cement tile from oil and acids that will severely damage it. If you liked this post, you might also enjoy Removing Grout Haze in a Cement Tile Installation.